Piratbyrån Piratbyrån ("The Pirate Bureau") was a Swedish organization (or think tank) established to support the free sharing of information, culture, and intellectual property. Piratbyrån provided a counterpoint to lobby groups such as the Swedish Anti-Piracy Bureau. In 2005 Piratbyrån released an anthology entitled Copy Me, containing selected texts previously available from its website. Members of Piratbyrån participated in debates on Swedish Radio and Swedish Television and also gave several lectures in other European countries, such as at the 2005 22nd Chaos Communication Congress in Berlin. The file-sharing debate is hereby buried. When we talk about file-sharing from now on it's as one of many ways to copy. We talk about better and worse ways of indexing, archiving and copying—not whether copying is right or wrong. Winter is pouring down the hillside. Make way for spring! Piratbyrån is entirely separate from The Pirate Party; it is more of a loosely organised think-tank, a website, a philosophical greenhouse or FAQ guide to digitization. The MPAA-funded Svenska Antipiratbyrån (Swedish Anti-Piracy Bureau), an agency devoted to fighting copyright infringement, was formed in 2001, before Piratbyrån. Piratbyrån humorously copied the name of their opponent, removing the "anti". In June 2010 the group disbanded following the death of co-founder and prominent member Ibrahim Botani, also known as Ibi Kopimi Botani. Several former members of Piratbyrån are now involved in Telecomix. The front page of the website was replaced with the three words Stängt för eftertanke (Swedish for Closed for reflection). Piratbyrån (The Bureau of Piracy) is not an organization, at least not primarily. First and foremost, Piratbyrån is since its beginning in 2003 an ongoing conversation. We are reflecting over questions regarding copying, information infrastructure and digital culture. Within the group, using our own different experiences and skills, as in our daily encounters with other people. These conversations often bring about different kinds of activities. Piratbyrån is not an organization but an on-going conversation on copyright, file-sharing and digital culture. Over the last six years Piratbyrån has been able to create a discursive space that enables individual and collective actors to be heard, and to significantly expand the range of opinions entering the public debate regarding copyright. To advance this conversation, they have been using a wide range of innovative, experimental, often humorous techniques – as well as traditional means such as public discussions, interviews and publications. The resulting debate has been multi-layered ranging from the technological (e.g. The Pirate Bay) to the artistic (e.g. a bus tour through Europe to Manifesta 08) to the political (e.g. Pirate Party). With very limited resources, Piratbyrån has been able to galvanize a political movement that has already shaped the development of digital culture and public policy in Sweden and across Europe, pushing the boundaries of the possible. Piratbyrån aims at nothing less than to fundamentally question the most basic categories – e.g. the distinction between the producer and the consumer – through which we understand culture in order to investigate if and how these apply to the digital condition. Piratbyrån does not claim to offer a solution to this extremely complex issue; indeed, it questions the assumption that copyright offers a one-size-fits all solution to cultural production, which now needs to be replaced with another unified solution. All of this has been done with great dedication and under considerable personal risk, yet they never forget that humor and irony are among the strongest weapons available to cultural producers. 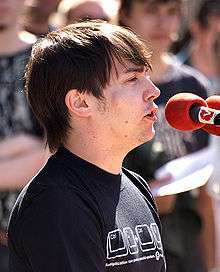 Rasmus Fleischer, spokesman of Piratbyrån speaking at a demonstration in Stockholm held 3 June 2006. Members of Piratbyrån founded the BitTorrent tracker The Pirate Bay in 2003 as a Swedish language site. The Pirate Bay now operates independently from Piratbyrån, although a number of The Pirate Bay administrators were also active in Piratbyrån. On the morning of May 31, 2006, the servers of both The Pirate Bay, a popular Swedish BitTorrent tracker, and Piratbyrån were confiscated in a raid by Swedish police. The seizure was part of investigation into possible illegal activities on the part of The Pirate Bay. Piratbyrån and the Antipiratbyrån set up a temporary news blog during the investigation. In Piratbyrån - The Bureau of Piracy Activities 2007, published in 2008, Piratbyrån list its activities for the year 2007. Activities by Piratbyrån members include lectures at universities and conferences, the publication of reports, participation in art projects and research projects, an interview with Vanity Fair in February 2007, participation in the planning of The Oil of the 21st Century conference in Berlin, presentations at a Norwegian computer party (The Gathering), interviews to the media regarding the raid on The Pirate Bay, opening of a webshop to sell Kopimi Klothing, participation in the organisation of protests to mark the one-year anniversary of the police raid on The Pirate Bay, attendance of the BELEF07 festival in Belgrade (Serbia), and participation in the organisation of a one-day art event in Stockholm titled "Who Makes And Owns Your Work". In March 2007 Piratbyrån members were invited to a meeting with the executive group for the Swedish Film Institute, to share their views about film and copying. According to Piratbyrån "The leadership listens with interest — only to some months later launch new anti-piracy initiatives...". In the same month Piratbyrån collaborates with the Norwegian group Piratgruppen, launching the counter-campaign "Piracy frees music" (promoted via The Pirate Bay), in response to the "Piracy kills music" anti-piracy campaign by the Norwegian record industry. In 2007 members of Piratbyrån also contributed to the production of the film Steal This Film (Part Two), which features interviews with Piratbyrån members and was released in December 2007. Piratbyrån organized the "Spectrial", a theatricalizing intervention in The Pirate Bay trial in Stockholm, early in 2009. Two Kopimi symbols, one with pyramid and one without. More variations can be found on www.kopimi.com and on Commons. The Kopimi symbol, also spelled kopimi, was conceived in January 2005 by Piratbyrån co-founder Ibrahim Botani. The logo, pronounced "copy me", can be used to specifically request people to copy and distribute a work, for any purpose. Botani intended the logo to be the opposite of copyright, which usually restricts copying a work, and as a unifying symbol of the anti-copyright ideas Piratbyrån stood for. As such, Kopimi may be considered an anti-copyright notice of sorts. Later in 2005, the Kopimi logotype was included in the Piratbyrån book Copy Me. It was also put on the front page of The Pirate Bay, where it remains until this day. The history section of the site stated: "Some of you may have noticed that little symbol at the bottom of the page, the pyramid. It's a symbol called Kopimi (Copy Me) which was founded by an old friend of ours, the artist Ibi Botani. It's basically about promoting copying. Using the kopimi symbol on something not only shows that it is ok to copy it, it says it wants to be copied, mixed or manipulated!" 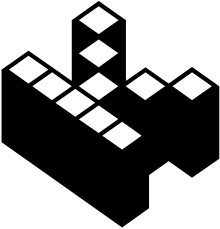 While Kopimi may appear to be a radical free content license, in effect similar to Creative Commons Zero, no one associated with Piratbyrån ever called Kopimi a license, instead describing it as a symbol of certain ideas. The website of Kopimi contains no terms or legal text. The Open Source Initiative, Free Software Foundation, or any other organisation within the open-source movement, does not list Kopimi as an approved license. Wikimedia Commons, a repository of free content and a sister site of Wikipedia, allows users to label their files with Kopimi. Kopimism and kopimist(s) are terms derived from Botani's symbol. It is unclear who coined them, but they have been used since at least July 2006. In January 2007, the Pirate Bay used the terms when they attempted (unsuccessfully) to buy Sealand, a large sea fort off the coast of England and a self-proclaimed country. The Pirate Bay declared: "To make sure the owners will be kopimistic and that the country won’t be governed by people that do not care about its future, we have come up with a plan. With the help of all the kopimists on Internets, we want to buy Sealand." The Missionary Church of Kopimism was founded in 2010 by Isak Gerson, a philosophy student and a member of the Pirate Party of Sweden. After two failed attempts, Kopimism was officially recognized as a religion by the Swedish government in January 2012. The Church considers copying a holy virtue, and uses various Kopimi symbols to present itself. Inspired by Kopimi, the Pirate Party of Brazil created their own version of the concept called "Copie", which plays both on the Portuguese words "copie" (meaning copy) and "co-pie" (meaning tweet together). The Copie logo shows 5 birds tweeting together. The Pirate Bay A bittorrent site. ↑ Piratbyrån (2005). Copy Me - Samlade Texter Från Piratbyrån (in Swedish). ↑ Palle Torsson and Rasmus Fleischer (December 2005). "Piratbyrån speech at Chaos Communication Congress 22C3 in Berlin". Archived from the original on 6 February 2006. Retrieved 15 July 2010. ↑ Walpurgis Piratbyran. Retrieved 16 July 2010. ↑ Andersson, Jonas (13 October 2009). Q&A re Pirate Politics liquidculture notebook (Blog). 1 2 Ernesto (23 June 2010). "Pirate Bay’s Founding Group ‘Piratbyrån’ Disbands" Retrieved 23 June 2010. ↑ Botani, Ibrahim (19 June 2008). "Untitled blog". Botanibladet. 1 2 3 4 "Piratbyrån – The Bureau of Piracy Activities 2007" (PDF). 2008. 1 2 oso (9 September 2009). |Ars Electronica| Communities Forum El-Oso.net. 1 2 History of Prix Ars Electronica / 2009 Ars Electronica, 2009. Retrieved 17 July 2010. 1 2 Fleischer, Rasmus (17 September 2009). Ars Electronica, XI: Definition of Piratbyrån Copyriot.se] Quote of David Sasaki. Retrieved 17 July 2010. ↑ Harrison, Ann (13 March 2006). "The Pirate Bay: Here to Stay?". Wired. Archived from the original on October 31, 2013. ↑ Ingram, Michael (7 June 2005). "Slyck Interviews The Pirate Bay". Slyck.com. ↑ "Piratbyrån Blog". Retrieved 25 July 2008. ↑ "Antipiratbyrån Blog". Retrieved 25 July 2008. ↑ The Pirate Bay Trial website. Archived March 6, 2009, at the Wayback Machine. ↑ Aman, Jan (September 2009). "In at the Deep End" (PDF). Dazed & Confused. ↑ Fleischer, Rasmus (23 June 2010). "Ibi Kopimi Botani". Copyriot. ↑ Piratbyrån (2005). pp. 153, 154, 160, 164. ↑ Unknown. "History of 2007". thepiratebay.org. Archived from the original on 1 February 2009. ↑ Open Source Initiative. "Licenses by Name". Opensource.org. ↑ Free Software Foundation. "Various Licenses and Comments about Them". gnu.org. ↑ –. "Pages that link to "Template:Kopimi"". Wikimedia Commons. ↑ The Pirate Bay (25 July 2006). "TPB announces its support for ACFI against Ladonia". thepiratebay.org. Archived from the original on 23 March 2007. ↑ Unknown (25 July 2006). "How the Kopimists Conquered Internets – and Launched a War". Solidarity with Ladonia! Stop the dirty war!. ↑ The Pirate Bay. "Buy Sealand". Archived from the original on 2007-01-26. ↑ Nguyen, Tuan. "PirateBay.org Wants to Be Own Country". DailyTech. ↑ Ernesto (4 January 2012). "File-sharing recognized as official religion in Sweden". TorrentFreak. ↑ Romig, Rolle (12 January 2012). "The First Church of Pirate Bay". The New Yorker. ↑ PartidoPirata Brazilian Pirate Party website. Retrieved 17 July 2010. Wikimedia Commons has media related to Piratbyrån. Art Liberated - Another project from Piratbyrån, highlighting remix culture and opposing censorship of art. The Grey Commons, strategic considerations in the copyfight Text by Piratbyrån's Palle Torsson and Rasmus Fleischer, presenting the activities of 2005. Between artworks and networks: Navigating through the crisis of copyright Theoretical lecture by Piratbyrån's Rasmus Fleischer. Presentation of Piratbyrån by Magnus Eriksson, from the Bzoom festival in Brno, October 2006.